Senior co-captain Bobo Carpenter has signed a two-year, two-way, entry-level contract with the New York Islanders. Carpenter, who missed 11 games with injuries this season, scored 19 points and brought his career total to 102 points. 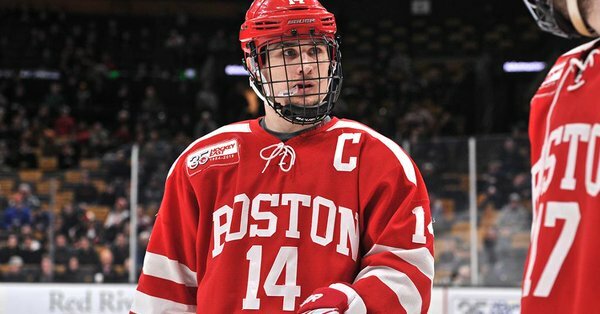 As a junior he scored 35 points and earned second team Hockey East All-Star honors and was a member of the 2017 Hockey East All-Academic team. Chad Krys scored his first pro point in AHL Rockford's 4-2 loss to Milwaukee. 2019 recruit Trevor Zegras scored a pair of goals in the NTDP U18s’ 6-2 win against Youngstown. His 74 points (23G, 51A) are third best on the U18s. Domenick Fensore assisted on Zegras’ first goal with a strong headman pass. He now has 34 points. 2020 recruit Braden Doyle, a defenseman at Lawrence Academy, has been named the 2019 recipient of the Boston Bruins’ John Carlton Memorial Trophy presented to the high school senior who combines exceptional hockey skills with academic excellence. Previous winners include Ty Amonte and Charlie Coyle. Charlie McAvoy scored his seventh goal in the Bruins’ 6-3 win against David Quinn’s New York Rangers. Charlie Coyle assisted on the power play goal.